14,707 units sold last year beat 2016 total by 23 per cent; market recovery and steady pipeline of launches seen supporting 2018 buying. Original article from Businesstimes.com.sg publiched on 16th Jan 2018 by Lynette Khoo. REFLECTING the upbeat sentiment in the property market, developers’ sales of private homes and executive condominiums (ECs) were the highest in four years in 2017. This momentum is expected to gain traction this year, given a healthy pipeline of new property launches. Based on preliminary estimates, developers sold 14,707 units, 23 per cent higher than the 11,971 units sold in 2016. The 14,707 figure included 10,682 private residential units, 34 per cent more than the 7,972 units sold in 2016; the sales of ECs held steady at around 4,000 last year. These figures are based on the developers’ sales survey conducted by the Urban Redevelopment Authority (URA) and final sales data from the first three quarters of last year. Tricia Song, head of Singapore research at Colliers International, said: “The encouraging sales volume and the pick-up in home prices in the second half of 2017 signalled that the private residential market had turned a corner, and should continue to recover this year in view of a steady pipeline of upcoming projects and positive market sentiment. About 25 major private non-landed projects (excluding ECs) with the potential to yield 15,000 to 16,000 units could be put on the market this year; she said this takes into account sites sold to developers as well as projects yet to be launched. Another sign of the strong momentum can be seen in how developers’ sales outpaced their launches last year – 6,066 private residential units were released for sale, 23 per cent lower than the year before, the consultants noted. Cushman & Wakefield research director Christine Li reckoned that the 2017 sales tally could have been higher, if not for several developers holding back launches in anticipation of an expected upturn in prices this year. Developers have thus pared back unsold inventory in older existing projects, with the majority of the top 20 sellers in December already more than 80 per cent sold. JLL national director of research and consultancy Ong Teck Hui estimated that 9,000 to 10,000 private residential units could be launched this year, and, together with about 2,000 units unsold in launched projects, should provide a healthy level of supply. But he added that developers’ sales performance this year will not only hinge on their launch supply, but also on pricing, a major determinant in sales take-up in new project launches. The diverse risk appetite that developers have demonstrated in their land bids have, however, drawn varied projections from consultants on the potential price increase this year – from 3 per cent to as high as 15 per cent, following a one per cent uptick last year. The risk of rising interest rates could keep buying demand in check as well. “If interest rates are raised gradually, that will not hurt the market, but it will dampen over-exuberance among buyers who are overly optimistic,” he added. Ms Song observed that based on caveats lodged, the bulk of new homes sold last year were in the price range of S$1,000 to S$1,499 per sq ft (psf). This indicates that amid the euphoria in the market, home buyers are still price-sensitive and that quantum is still a key determinant in property purchase, she said. 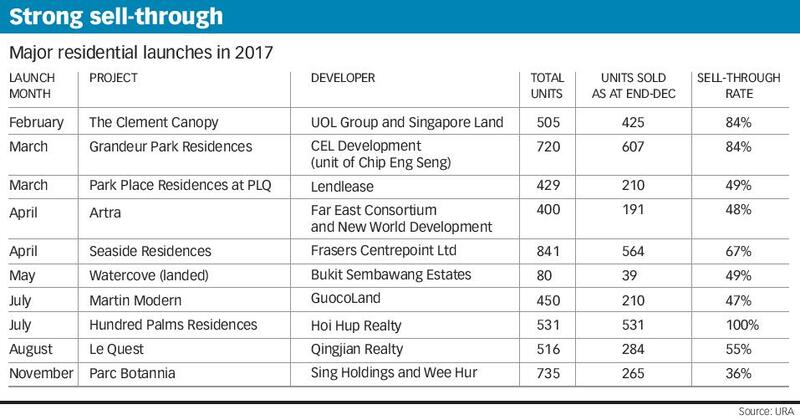 Developers that sold the most units last year were Qingjian Realty, Frasers Centrepoint and City Developments (CDL); each clocked sales of more than 1,000 units last year, based on the tabulation of boutique consultancy SRI Research. 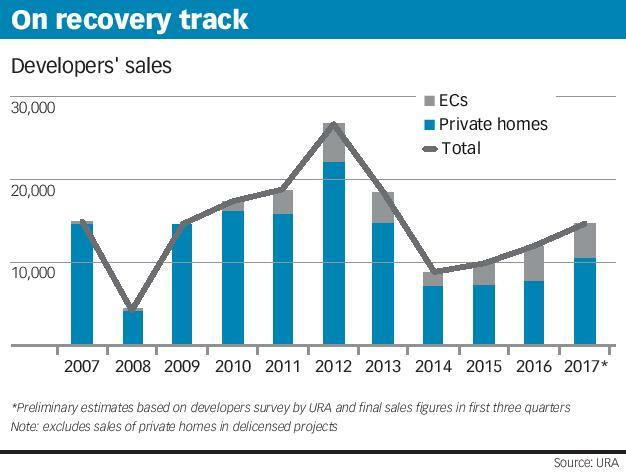 URA’s data indicates that developers sold 531 private residential units and ECs in December, a month typically marked by a lull. The figure is 43 per cent lower than that for November, and eight per cent below that for December 2016. Of the 531, 431 were private residential units – a 45-per-cent drop from November, but a 17-per-cent increase from the year before. LIIV Residences, a 23-unit development by LCT Land, was launched in December. Three units were sold at a median price of S$1,761 psf. The first project to come onstream this year is CDL’s New Futura, a 124-unit freehold development in Leonie Hill in District 9. It will begin sales this Thursday through appointment-only viewing. Prices start at S$3.8 million for a two-bedroom unit of 1,098 sq ft, said agents. Also in the pipeline is the only new EC project this year, Rivercove Residences. Jointly developed by Hoi Hup Realty and Sunway Developments, this is likely to be launched in March. Twin View at West Coast Vale, by China Construction (South Pacific) Developments, is expected to be launched in March or April.